Panleukopenia, feline herpesvirus infection, feline calicivirus infection, feline leukaemia (FeLV infection), feline immunodeficiency (FIV infection), feline infectious peritonitis, rabies, avian influenza, Chlamydia (Chlamydophila) felis, Bordetella bronchiseptica, Aujeszky's disease/pseudorabies, cowpox virus infection, viral papillomatosis, Bartonella and Pasteurella multocida infection, Coxiellosis/Q fever, Leptospira species, Yersinia pestis, Francisella tularensis, Capnocytophaga canimorsus infections and mycobacterioses. Of the mycotic infections, dermatophytosis, aspergillosis, cryptococcosis, sporotrichosis and rare systemic (blastomycosis, histoplasmosis, coccidioidomycosis) and opportunistic mycoses (phaeohyphomycosis and hyalohyphomycosis) are being dealt with. The protozoan infections by Toxoplasma gondii, Leishmannia, Babesia, Tritrichomonas and Giardia are explained. ​Recent articles on Borna virus and West Nile virus infections, as well as vaccination recommendations for cats with different lifestyles (Matrix) and in a shelter situation complete this update. A synopsis of the above ABCD guidelines were published in the July 2009 issue of the Journal of Feline Medicine and Surgery. This issue also contains articles on vaccination (principles and polemics), and on the principle of evidence-based medicine. As a sequel to the 2009 guidelines, ​the July 2013 and 2015 issues contain articles on Aujeszky's disease/pseudorabies, cowpox virus infection, papillomatosis, Bartonella and Pasteurella multocida infection, Coxiellosis/Q fever, Leptospira species, Yersinia pestis, Francisella tularensis, Capnocytophaga canimorsus infections and mycobacterioses. Of the mycotic infections, dermatyphytosis, aspergillosis, cryptococcosis, sporotrichosis and rare systemic and opportunistic mycoses are being dealt with. The section on protozoan infections contains chapters on Toxoplasmosis, Leishmanniosis, Babesiosis, Trichomoniasis and Giardiasis in cats​. Finally, Borna and West Nile virus infections, streptococcal infections, lungworm disease, and the rare cytauxzoonosis and hepatozoonosis conditions are discussed. This issue contains update articles of the 2009 and 2013 guidelines, and new recommendations for cats with different lifestyles, rescue shelter cats and breeding catteries - which we have called "Matrix vaccination guidelines". You will also find new articles on blood transfusion, disinfectants and the feline injection-site sarcoma. 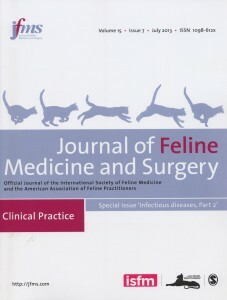 As a sequel to previously published guidelines, ​the July 2015 issue contains articles on Borna disease and West Nile virus infections in cats, on streptococcal infections, lungworm disease, and the rare cytauxzoonosis and hepatozoonosis conditions.